After the ceremonial opening of the Fourth FIDE Grand Prix Chess tournament at the Musical theatre in Nalchik, KBR President Arsen Kanokov and FIDE President, Head of the Republic of Kalmykia Kirsan Iljumzhinov answered the journalists’ questions. 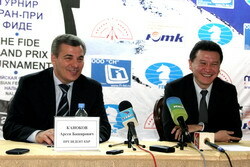 In his opening speech Arsen Kanokov pointed out that chess is becoming an important part of the life of the republic, and tournaments of this kind serve as a strong impulse for the development of mass sports: “Kabardino-Balkar Chess Federation headed by KBR Deputy Prime-Minister Madina Dyshekova is actively working. Recently I have been to Tersky district where I saw how enthusiastically children from the chess- club "Ladja " were involved in chess playing. We are planning to open such clubs throughout the Republic and starting from September to introduce chess classes into the schools as an optional subject”. Coming back to the introduction of chess classes into school curriculum, Ilyumzhinov pointed out that Turkey showed everybody a good example by introducing chess classes into 64 thousand schools, the students’ academic level being considerably improved. Explaining why Nalchik has been chosen for the sport event, Kirsan Ilyumzhinov informed: «With your republic and your President Arsen Kanokov we have established strong friendly ties long before. Hopefully, the tournament will be held at the high organization level and in a quiet and friendly atmosphere». Journalists wondered how Arsen Kanokov came to convince KBR Government in the necessity of allocating money to this event.